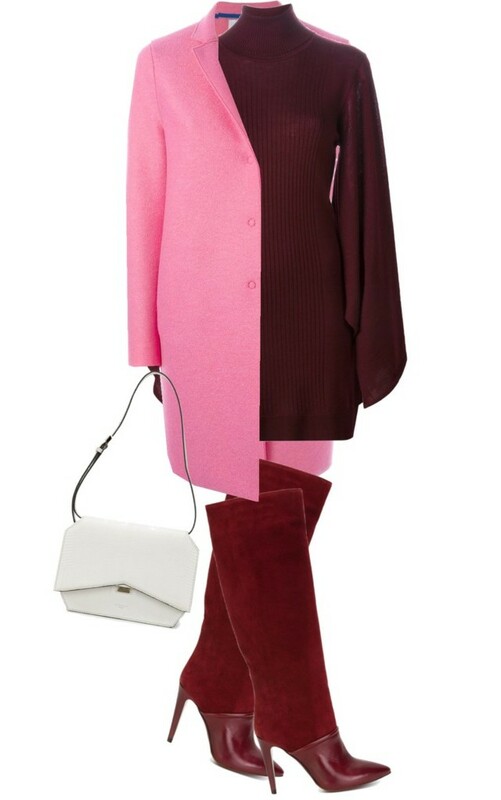 Home In The Mix Outfit Ideas Burgundy sweater pink jeans white coat? Burgundy sweater pink jeans white coat? We’re still on our burgundy and pink trip. We’re casually clad in burgundy and pink with some white today so we’ve decided to do an outfit idea post built around these three colors. Depending on who you ask, burgundy and pink are the colors of the season. Burgundy is one of those colors that can surprise you. You might be tempted to avoid it because it’s not so commonplace and by itself it seems kind of boring, but then you see someone wearing an outfit with burgundy and you realize it’s not that boring a color after all. And it goes surprisingly well with colors you wouldn’t necessarily expect. Not everyone will agree that burgundy and pink go together but we’re loving the combination. 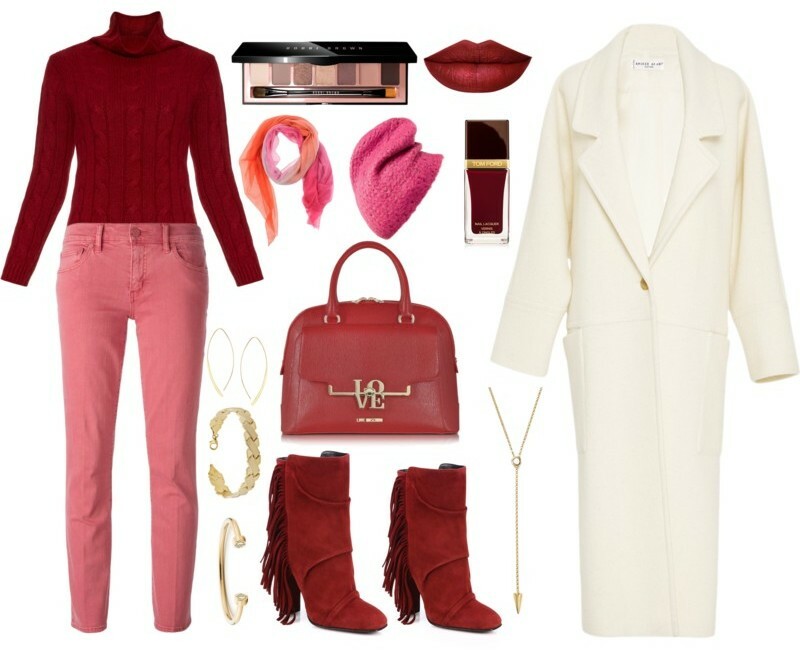 Our outfit idea pairs a wine red (basically a bright burgundy) Queene and Belle San Moritz cable-knit roll-neck sweater with a pair of pink cotton blend cropped slim fit jeans from Tory Burch. 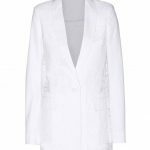 For outerwear we’ve chosen an ivory white oversized coat from Apiece Apart. For footwear we’ve chosen a pair of Giuseppe Zanotti Fringed Suede Mid-Calf Boots in a burgundy color. 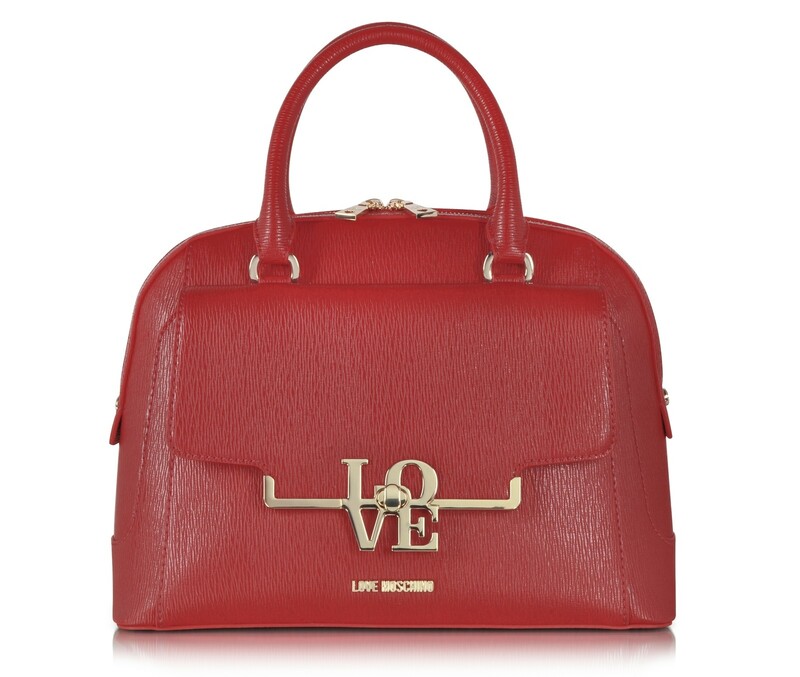 The bag is a brick red Love Moschino Eco Leather Medium Satchel. The look is accessorized with a pink waffle knit slouch hat, a Giorgio Armani scarf, and yellow gold jewelry. Depending on our mood we would go for a pink or wine red lip and wine red or pink nails to go with this look. 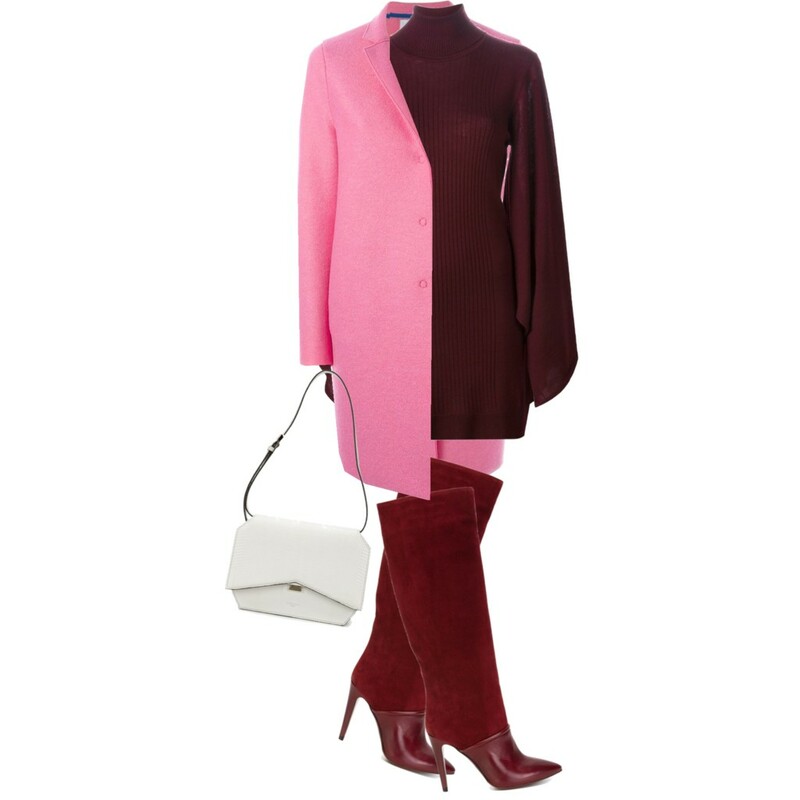 A burgundy Emilio Pucci Bell Sleeves Ribbed Turtle Neck Sweater worn with burgundy L’Autre Chose Knee High Stiletto Boots, a pink Harris Wharf London Single Breasted Coat and a white Givenchy medium ‘New Line’ shoulder bag. 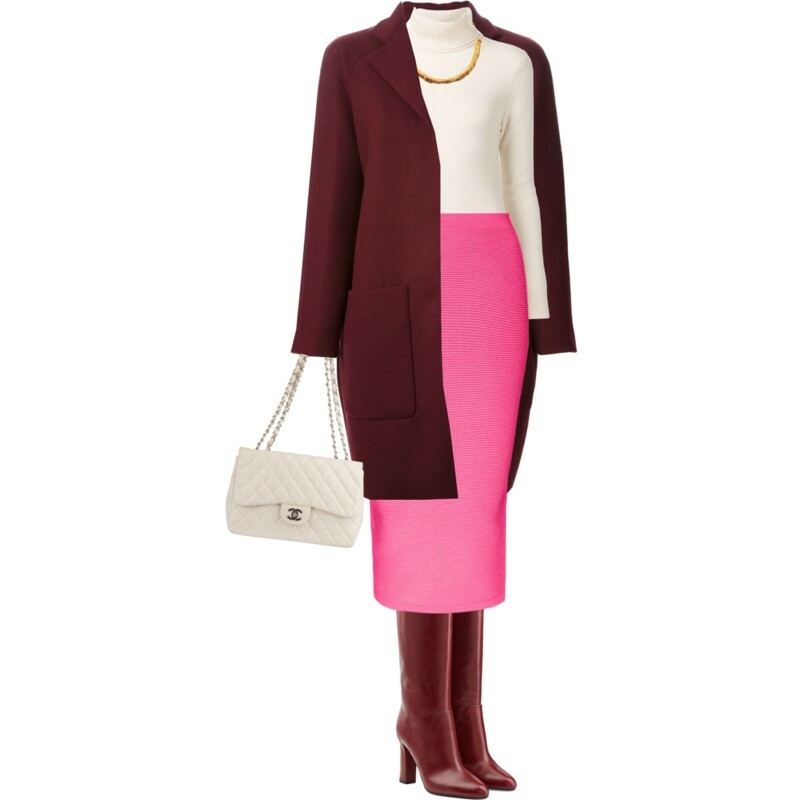 A pink Cushnie et Ochs Pink Mid Length Body Con Skirt paired with an ivory/cream/white Chloe Classic Turtleneck Sweater, a burgundy Gianluca Capannolo Egg Shaped Coat, a pair of burgundy Diane von Furstenberg Leather Knee Boots, a cream/white Chanel Jumbo Classic Flap Bag and a Vassiliki Folded Solid Gold Choker. What do you think of our outfit ideas? Would you wear these looks? Do you think burgundy and pink go well together?